It’s not really all that hard to figure out. They’ve gone where they’ve been told to…out. Men are meant to play a God-given, pivotal role in the family, in the Church, and in culture at large. It’s a role that’s too often abandoned or belittled…to dire effect. We lack children. We lack vocations. We lack men. We are in a crisis that is simply not being addressed by enough people. And if we don’t change things quickly, the extensive damage will only get worse. 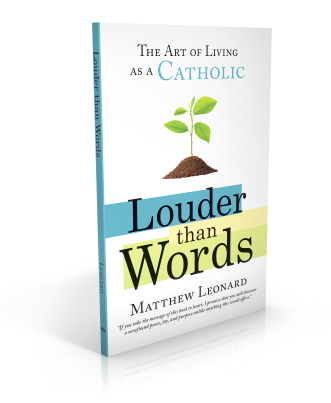 This is not a “let’s beat our chests and be men” episode of the Art of Catholic. Nor is it a “let’s hammer on men” episode. This is an episode centered around an epidemic that desperately needs attention from both sides of the gender aisle (and yes, there are only two). It’s a topic crucial to the vitality of the Church. We need to stop asking “Where have all the good men gone?” We know where they are. Now let’s go get them. If you don’t have a real life of prayer, you’re fooling yourself spiritually. 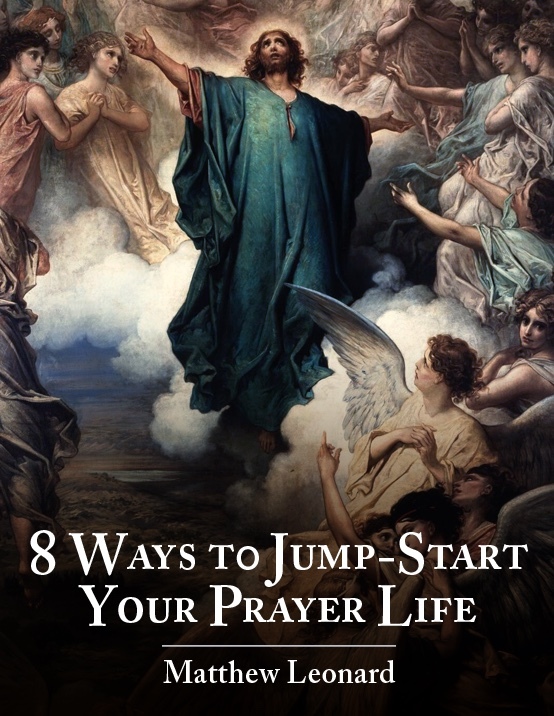 Grab your FREE copy of my quick guide to deeper prayer 8 Ways To Jumpstart Your Prayer Life! It’s an easy step-by-step summary of the spiritual giants of the Church designed to help you rocket to God! Don’t miss a show! 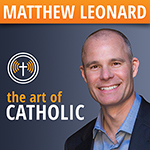 Subscribe to The Art of Catholic by clicking this link and then clicking “View in iTunes” under the picture and then “Subscribe”! Walk in the footsteps of Jesus! Check out the new video about my Pilgrimage to the Holy Land in March 2018! It’s the trip of a lifetime! Click here for trip details. Thank you for the statistics on children who stay in the church. I have felt myself a failure because my husband would not attend church or have anything to do with our sons Catholic upbringing. They went to Catholic school grades preschool through 8th grade. I took them to church by myself. Our sons are in their 20s and not only do they not attend church but they do not believe in God. I have felt a failure. Knowing the statistics you quoted has really shed light for me. Thank you again. Cynthia, don’t lose heart! You were (and are) fighting an uphill battle. That said, your job is simply to be faithful as a mother and pray your guts out for your kids. It’s the Holy Spirit’s job to change their hearts and he is more than willing and capable:). If you’re not already, pray for the intercession of St. Monica, whose son Augustine was a complete degenerate, but as we know became one of the greatest saints in the history of the Church through her prayers. God bless you! Powerful program, Matthew! It reminded me of my step-dad. He was what people back then called “a good Catholic.” He was a member of the Holy Name Society. And I remember the good feelings that radiated from him when he or one of his fellow members got someone to stop using God’s name as a curse. As I listened to you and Bear, it hit me that, in their way, these men were saying “¡Viva Cristo Rey!” It’s a small enough step that any man, with group support, could do it and grow from doing it. Amen, Lawrence! (And I think I would’ve liked your step-dad!) God bless you! Hi Matt! I really enjoyed this podcast. As a mother of 4 young boys (7 and under) I am looking for ways to practically help the boys develop into the men God created them to be. As you well know, the culture is pitted against us. Maybe some day you could do a podcast on raising boys? 😊 Most of the info I come across is geared towards parenting teenagers but I’d love to see something geared towards parents of toddler/young boys. Thanks! God bless you! Hi Emily. I’ll put that one on the list. That said, my oldest boy is only 10 and my other one is 3, so I’m no fount of wisdom:). I feel like I need a little more experience. The proof, as they say, is in the pudding. But it’s a great suggestion. Raising boys is a huge topic, especially in today’s culture. Thanks! I dispute your generalizations about half the human population and what works for them related to the faith, mass, and especially MUSIC. Because you don’t prefer the music you mentioned, you call it “over-feminized”. The liturgical music you disdain, my husband sings heartily, finds meaningful, and appreciates its scripture-based lyrics and singability. Older hymns are great too, but aren’t necessarily more “masculine”. The great diversity of people that God created for His purposes are drawn to a great diversity of spiritual offerings and musical styles. 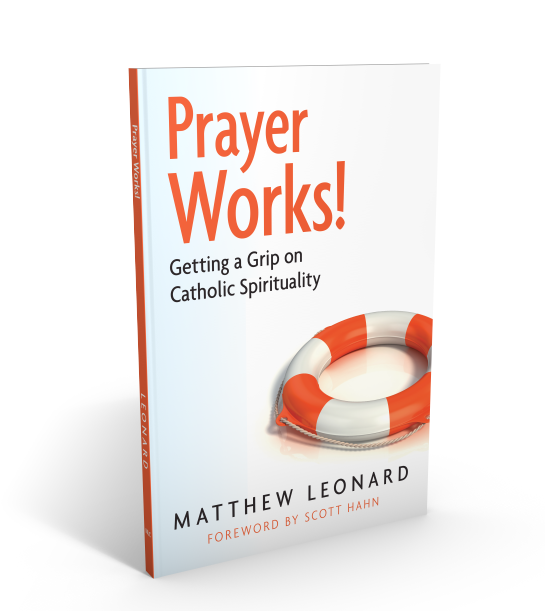 One of the strengths of Catholicism is that we have so many ways to connect with God. How about recognizing that Catholic men may have deprioritized their faith practice, and thus provide less leadership than in the past, because they have bought into and been distracted by the American culture’s values for “success” and “prosperity”? Women are at risk of following right behind, as are our children. Not all men are looking for the toughest, most challenging, battle-oriented approach to growing in faith. Jesus did not idealize the warrior mentality. I’m all for pursuing truth, virtue, beauty, spirituality, sincere prayer, etc. but let’s recognize the variety of versions of masculine. I appreciate your comment, Laura, as well as your husband’s engagement in the mass. That’s great. Certainly grace builds on nature and different things appeal to different people. I also heartily agree that men (and women) have de-prioritized the faith and have bought into the worldly distractions that the Evil One constantly dangles in front of us. It’s one of the major reasons I started my podcast. That said, it’s also a fact that the vast majority of the men who even go to Mass are not really engaging it. They don’t sing the songs and they don’t pray the prayers. I see it all over the country. And it’s partly because much of the music that is offered does not appeal to anything masculine. Just yesterday, a man I’d never met (and who I don’t think even knows about my podcast) came up to me after Mass and vehemently complained about how banal and feminine the music was in the liturgy. And I hear very similar comments all over the country…much of it from young priests. 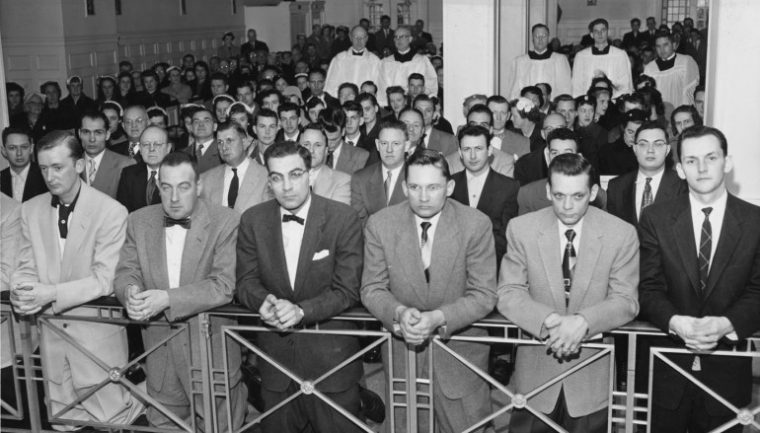 Of course, we’re only talking about those men who actually still go to Mass. I think many were driven out by the some of more effeminate music and lack of a transcendent liturgy. And that’s, I think, the deeper point. So much of the music we sing is “horizontal” (i.e. about us) instead of “vertical” (about God). There’s a whole ideology behind it that came out of a misappropriation of Vatican II. So while it may be working for a few, rapidly declining Mass attendance tells us that it is not working for most. God bless and thanks again for your comment. I'm ready to pray! 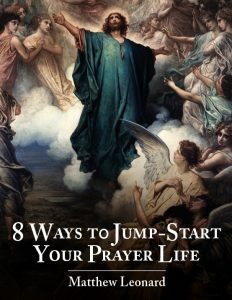 Send me the FREE guide "8 Ways To Jumpstart Your Prayer Life." Privacy Guarantee: We can't stand spam, either! Next Level Catholic Academy is Coming! Holy Land with Matthew & Jim Caviezel! Ever Heard of the 3 Stages of the Spiritual Life? Time To Find Out! Click Here! 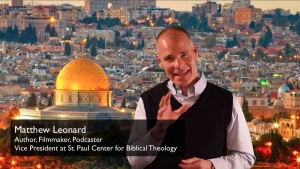 I am an author, speaker, podcaster, Vice President and Executive Producer at the St. Paul Center for Biblical Theology. I’m married to a beautiful woman named Veronica with whom I have six children (so far…she’s 10 years younger so you never know). ©2019 Matthew Leonard. Powered by the Get Noticed! Theme.